Gigi Leung sees herself on the giant screen and breathes a sigh of relief. "Much prettier than I imagined!" 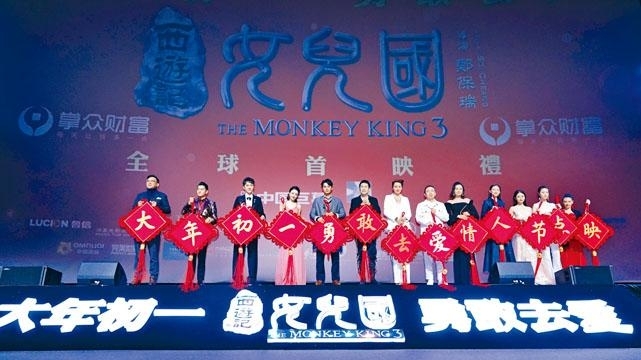 The Lunar New Year's Eve release fantasy romantic comedy film THE MONKEY KING 3 (SAI YAU GEI NUI YI GOK) two nights ago held its global premiere in Beijing. The film company boss Alex Wong Hoi Fung, director Soi Cheang Pou Soi, executive producer Huang Bo and stars Aaron Kwok Fu Sing, William Feng Shaofeng, Zanilia Zhao Liying, Gigi Leung Wing Kei, Law Chung Him, Xiao Shenyang and Alice Chan Nga Lai appeared; Li Ronghao and Jane Zhang Liangying performed the theme song HERLAND, while Henry Lau and Lang Lang also performed FEMININE LOVE. 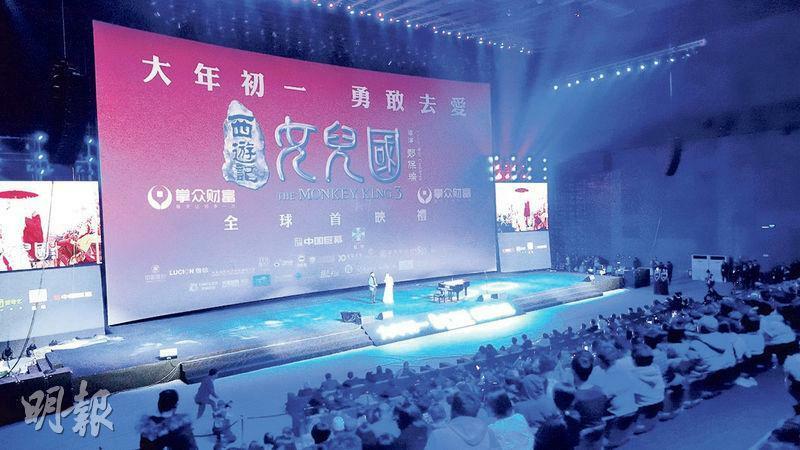 The film even invited famous conductor William Hu Wei-Li and 76 Chinese film orchestra member to perform the JOURNEY TO THE WEST OVERTURE. The event preparation began two months ago and spent seven times to construct the highly difficult, biggest in Asia 3D laser giant screen. The entire screen weighed 1.3 tons, around five stories tall, its area was larger than a standard basketball court; the screen left the actors in awe. Sing Sing said, "It's the first time I watch myself on such a large screen. The giant screen coordinated with the sound effects very well. It's awesome!" Gigi said, "Today is the first time I see it. Seeing my relationship with River God Lin Chiling on the big screen, even I couldn't help but cry." As for the most memorable scene, everyone agreed that it was the water battle. Two nights ago at the premiere, the strong visual impact that the super large screen brought was in your face. The water special effect and the world's highest luminance 4K laser projector, the super high definition 3D luminance displayed even richer color and clear picture quality. Law Chung Him said, "We stood in front of the green screen in many scenes. We acted relying on imagination alone, we never thought that the resulting effect would be so rich." Sing Sing added, "Our underwater scene was mostly shot with green screen. The set only had basic equipment, maybe a house, a boat, I would never imagine the resulting effect would be like this!"